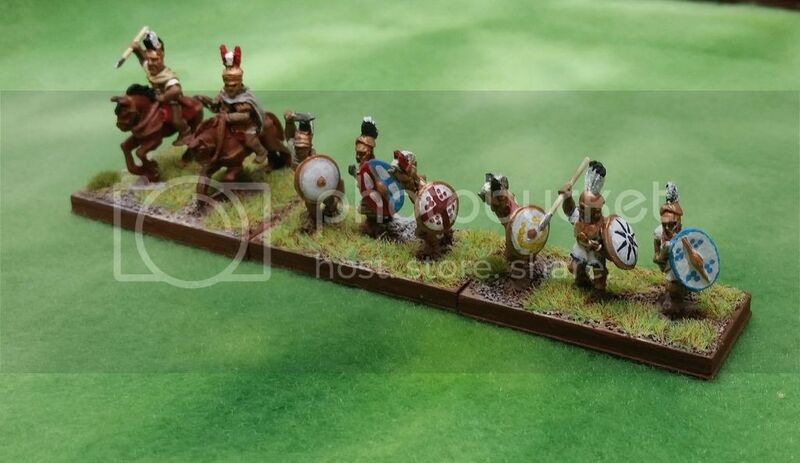 This Marian Roman Army is an adaption of a DBA Army that I painted in 2008 while in Baghdad. There are nine stands of Elite Foot, including a command stand. The Triumph! army list only allows eight stands, so there is an extra. The two stands of Skirmishers are also from 2008. I had to create two stands of Light Foot and a stand of Javelin Cavalry to bring the army up to 48 points. Almost all of the figures are by Old Glory. A tomb frieze from Nola from the 4th century B.C. Looking forward to making my Marians up to Triumph standards, but sadly mine are PotN figures... and I don't think I am going to be able to find additional ones at this point fill in the extra stuff. 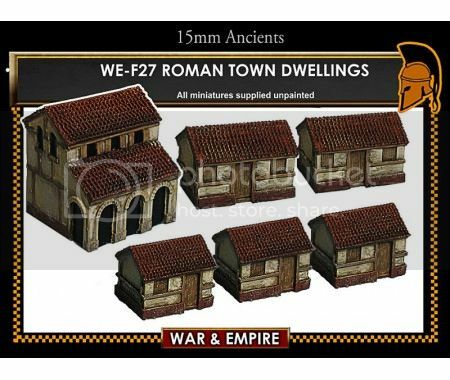 I created some modular village terrain for my Roman and Spartacus armies. All the main pieces - buildings, walls, and fields - are movable so they can be shifted out of the way when troops are moved into the village. It also allows the village to be as small as 4" square by leaving off everything except a single base tile and a small building. 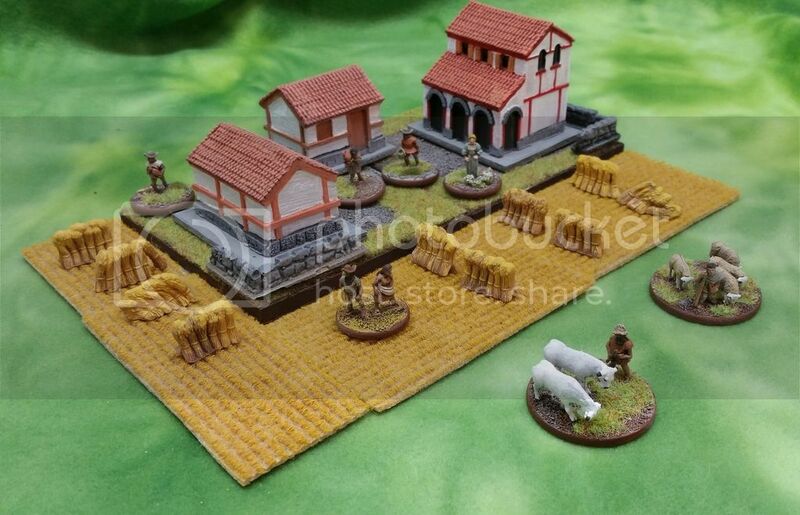 There are several civilians and animals (War and Empire figures) that can be placed in and around the terrain to add interest but that have no game effect. 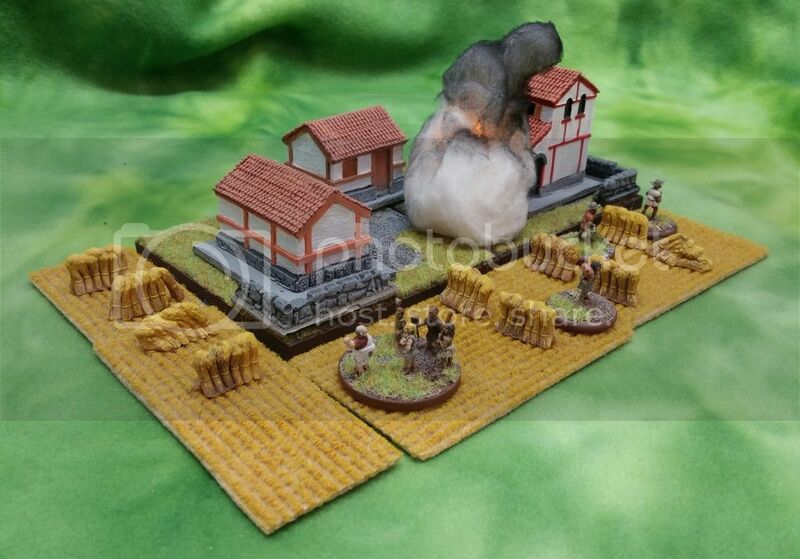 The civilians peacefully carrying items in the previous scene are now looters fleeing the burning village while others confront a Roman citizen. The smoke marker has a flickering yellow tealight (2$ for a set of 2 at Hobby Lobby) inside so it lights up. Very nice, where did you get the buildings? The buildings are from War and Empire. They are cast in resin and good quality with no flash or pitting. The pack comes with six buildings. The buildings are great. Great way to tell a story within the game.